By turning the sunlight into electricity, the solar panel charges your mobile devices (5V/2A USB output) as well as car battery (18V/3A DC output) wherever you go. It comes with a car charger for charging your car battery via car cigarette lighter, and a pair of clamps to charge the battery directly. 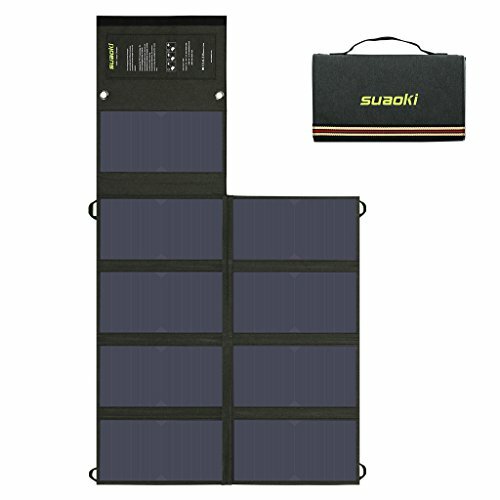 The Suaoki solar panel is made for adventure, it can be folded into a briefcase for easy transport. Whether you're headed up to the mountains this weekend or flying overseas, you can enjoy solar energy by placing the panel on the outside of your bag, absorbing solar energy while hiking or camping. The SunPower Solar Panel works under light level as low as 40,000 lux and it has a high conversion efficiency of 22%. Besides, the built-in smart chip adopts TIR-C technology, which makes it quickly identify the current of your devices and speed up the charging process. Please check the model, size, voltage and power of your laptop adapter to ensure compatibility before using. The 10 Laptop Connector Cables only applies to some models of the corresponding computer rather than all of them.